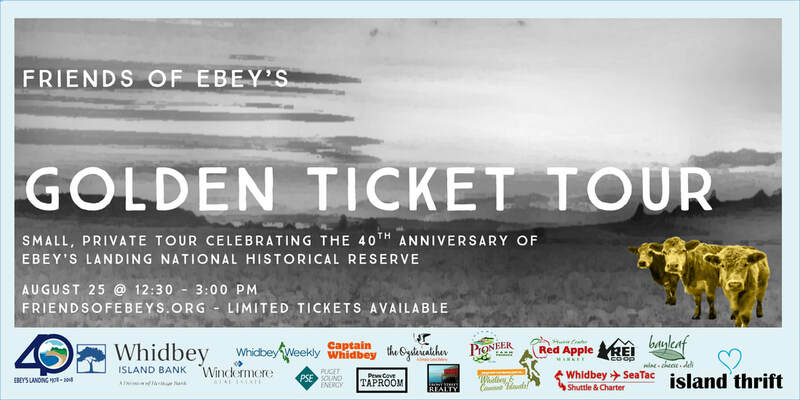 Buy your tickets here for the exclusive fundraising tour celebrating the 40th Anniversary of Ebey's Landing National Historical Reserve. The Golden Ticket Tour begins at ​Sherman's Pioneer Farm (46 S. Ebey Road) where you will have premier parking for the Picnic on the Prairie, following the tour. A guided bus tour from Reserve experts featuring iconic and rarely seen stops, telling a story of the Reserve: past, present and future. Throughout the tour, you will enjoy locally-sourced appetizers from favorite local restaurants The Oystercatcher and The Captain Whidbey, as well as hand-picked drink pairings from Coupeville's bayleaf. As always, all proceeds from this fundraiser will go back into the Reserve. Questions? E-mail alix@friendsofebeys.org or julie@friendsofebeys.org.